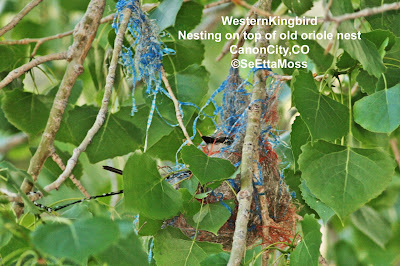 Today I found a Western Kingbird nesting above an old oriole nest. This pair of kingbirds lost a prior nest a few weeks ago when it was blown off a utility pole, a common location for their nests in this area. They apparently built their new nest on top of the old oriole nest that has not been occupied by Bullock Orioles this year. 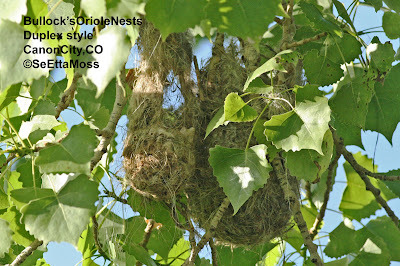 This may be a good strategy since the old nest has survived a year in good condition. 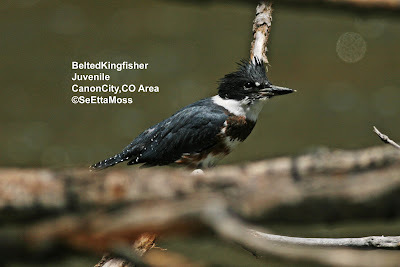 I have been watching a family of 4 Belted Kingfishers over the past 3 days. I believe there are an adult male, an adult female, and 2 juvenile birds so I suspect the parents are still teaching the young to fish. They could be fledglings as they have not shown any sustained flight, but I haven't been able to find the parent's feeding them which would confirm fledgling stage. 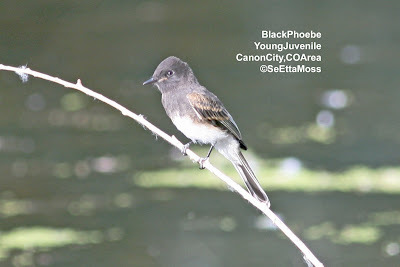 Yesterday 2 juvenile Black Phoebes found their way to one of the ponds on my friend's property east of Canon City. I suspect these are the offspring of a pair of Black Phoebes I observed on the west end of my friend's property for several weeks this spring. I couldn't relocate them a few weeks ago and thought the pair might be nesting under a nearby RR bridge where a pair of Black Phoebes had successfully nested last summer (and likely the summer before). Since I haven't seen them in that area recently (and they would be fairly obvious as the parents secured food for the growing youngsters) I think they found another location, though somewhere not far, to nest.